Well the good news is that I got all the objects and they are surfaced and the scene file works. The bad news is because of 90,000 polys and all the transparency the time estimate is 4-5 hours with no AA or radiosity set. I can render this over night, we'll see what it looks like. Usually many test renders are needed, but at 5 hours per test, it doesn't look good. I know there was a setting on the converter to use the "Lego" logo on the studs, that just makes things worse. If you want to, try and set that off and send me the objects again. First things that die in a Battle? Those last few I sent are the best its going to be because of the multiple layers of 70% transparency just block out everything. For everyone else: I solved the massive render time problem. The scene file had volumetric lights/reflection/refraction on. So with those off I could get a 10 second render. If you remake it with thin panels on each side, it may work better. I'm interested to see how G2's render handles the transparency. To all who doesn`t know what this is: The gelatinious Cube is a AD&D Monster that runs around in Labyrinths all the time and keeps it clean. I will give it some unique skills when i am ready with it. 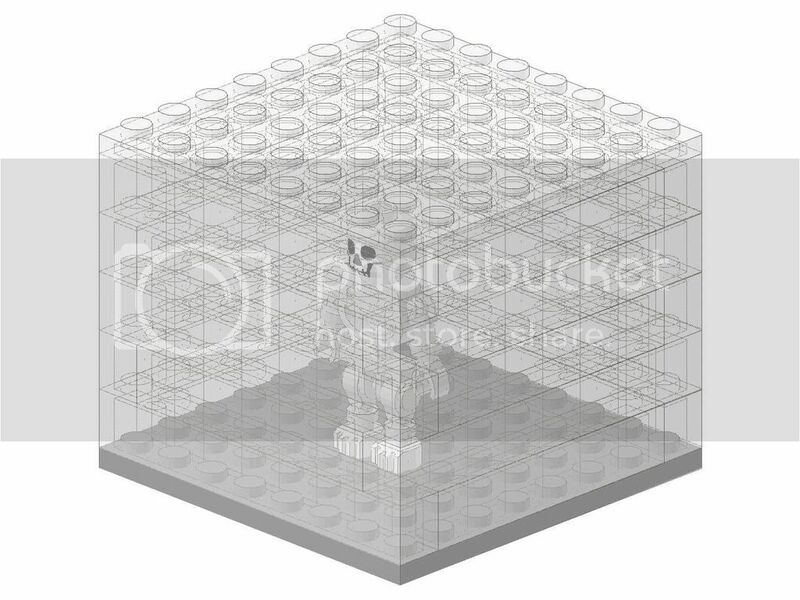 I could build it, but i have not enough clear bricks and i think there is no 8x8 clear plate. 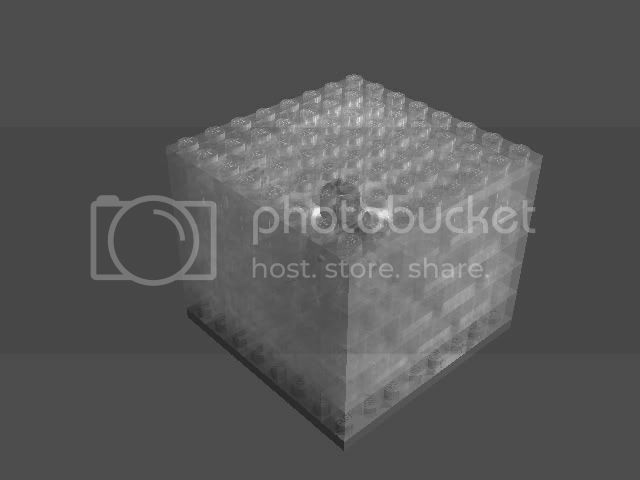 I used 1x2x1 but maybe 1x8x1 and 1x6x1 would be getting better transparencies. We can see thru the top plate. If the sides were made of plates I think it would work. 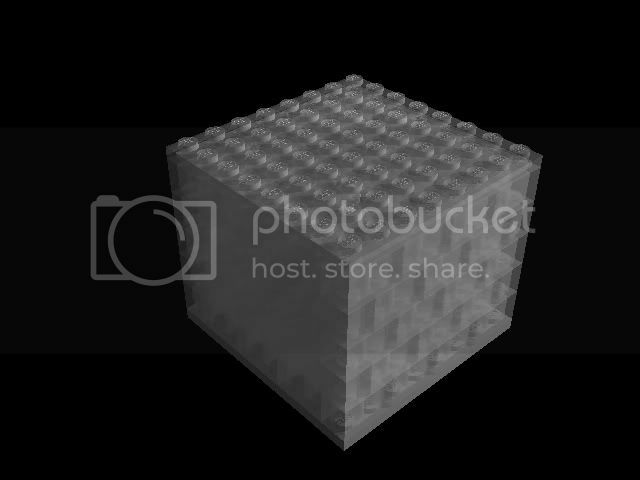 That last image has 4 point lights inside the cube since light wasnt getting in so easy. Last edited by Tzan on Fri Jan 18, 2008 2:40 pm, edited 2 times in total. Thank you and Thank you. - I try hard get them looking nice. This is just a screen shot of Lightwave, not a render. 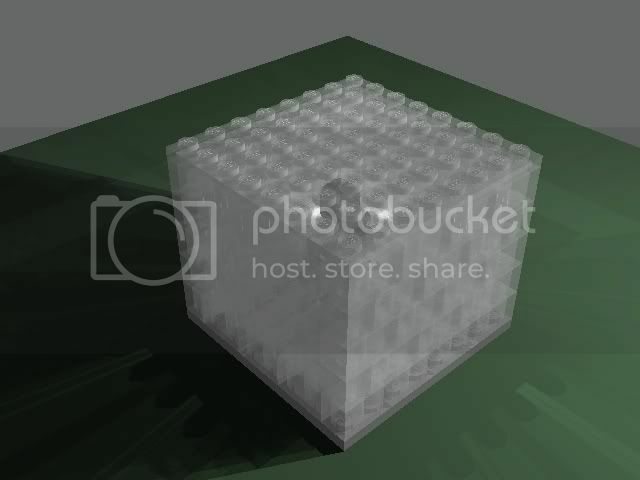 I can render it in Blender, but with default materials it won't look incredible. G2 - could you explain your render style in a PM? Thank you. 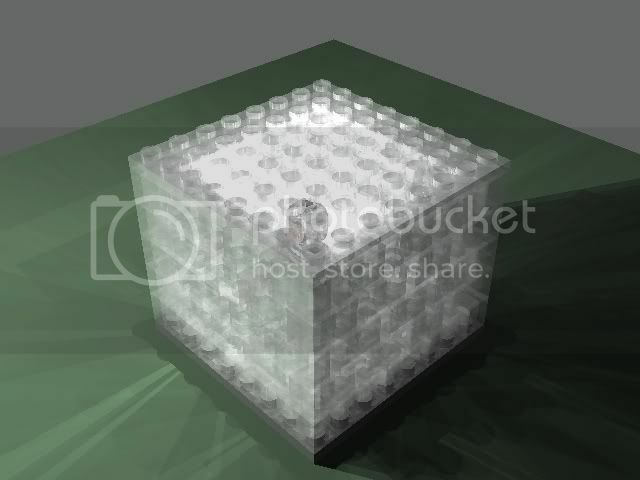 I manually loaded all 70 objects into one object so I could adjust the surface of the cube. Previously I would have needed to adjust all 70 one at a time to make one surface change, yuk. Was T 70, D 100. And what about G2? Are you on it? Flashhawk wrote: And what about G2? Are you on it? Yes I am, but the computer which I do most of my CAD work is at my work, which I have not had access to (due to working out-of-the-office) for the last few days. I will be able to do something tomorrow though. So stay tuned.